Oh the joys and struggles of The West Wind Brigade! Especially those well-endowed “joys”. If you don’t recall, The West Wind Brigade is a guild from Log Horizon led by Akihabara’s and the Round Table’s very own Soujiro Seta. The fiery and relentless dream boy followed by dozens of girls he would defend to his very last hit point. But I digress. More importantly, there is a puppy squad that searches for booby traps in this volume! The story picks up with Soujiro paralyzed on the ground in the hands Magus, a conniving adventurer who we learn is influencing the horde of player killers. The volume has a great opening that draws you into an action scene that has an excellent mix of comedy and fierce combat. As is indicative of Log Horizon combat, the tactics and strategy really get you invested into the scene rather than focusing on mindless collisions. The fighting also gives a chance for the girls to individualize themselves in the spotlight with cool, intense, and comedic moments. That creates some of the best moments in this volume that only a setting in Log Horizon can dish out. After the fighting, the story dives deep into the character motivation and themes that Log Horizon is best at. Along with showing where Magus gets his delusional obsession with Soujiro, we also get to see Soujiro’s own reaction to the disbanding of the Debauchery Tea Party. The flashback is satisfying in giving us an idea of Soujiro’s character and where he fit in with the Tea Party. With the arc being wrapped up this volume and some serious questions left about who Magus really is, the series shifts to Shiroe’s group in an odd transition. I didn’t expect to see part of the main series, so it was definitely a treat. Being a huge fan of the main series, The West Wind Brigade did not disappoint, especially with it’s comedy and tying in the story of the guild with the main plot. The art is very well done and the writing is straight-forward. Next up is fixing Akihabara’s food! 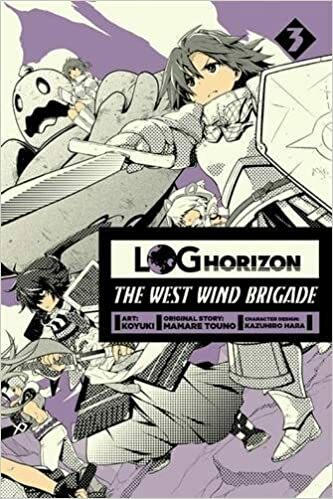 Disclaimer: A copy of Log Horizon: The West Wind Brigade Volume 3 was provided to BentoByte by the publisher for the purpose of review.